Blocs has integrated support for a range of premium and open source third party content management systems, allowing you to easily create powerful, dynamic websites, that can be updated and contributed to outside of the Blocs application. However, it’s also possible to set a Blocs project to be targeted to one specific CMS and there are benefits to doing this. When making areas CMS editable there are less options to select from on the contextual menu. Also, the Export Project option from the file menu automatically detects the CMS project type and exports your project accordingly to work with that CMS, meaning you don’t need to navigate to and use the dedicated export option for that CMS type. 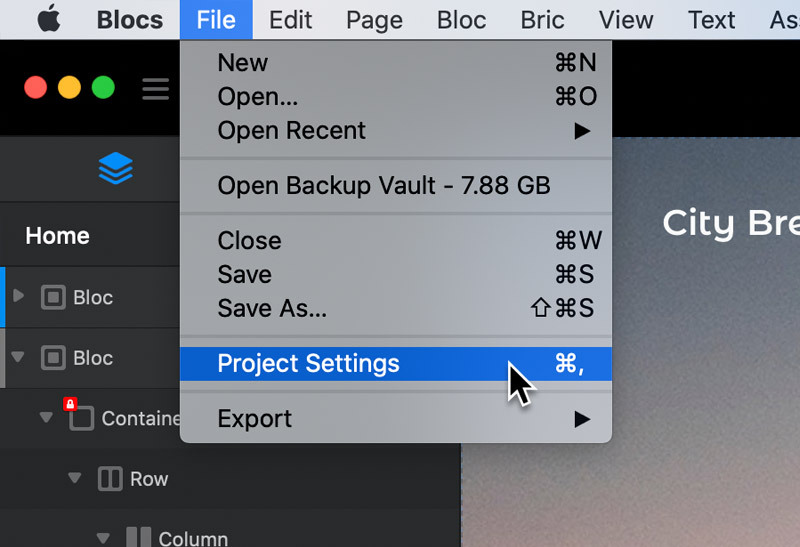 To set a projects target CMS to a specific one, first navigate to the main project settings by navigating to File > Project settings from the apps main menu. Once the project settings option sheet is open, navigate to the last option in the sheet navigation, this option is represented by 3 dots. Left Clicking this icon will open the miscellaneous project options. From the miscellaneous project options you can set the projects target CMS using the drop down menu button labelled Project CMS.